Are Your Teeth Out of Shape? You hear about things that you can do when your body is out of shape, but what about your teeth that are out of shape? Is there some kind of exercise program that can benefit them too? Minor reshaping can give you a whole new look! Highly unlikely you say? Well yes, but there is something you can do to correct teeth that are crooked, jagged, too long or overlapping – and it’s really quite simple. The procedure is called dental contouring or shaping and it’s fast, effective, and pain-free! To find out whether you are a good candidate for this procedure, call our office and schedule an appointment and learn about all your options for gaining a healthy smile. What Happens During the Dental Contouring Procedure? Usually this procedure takes place in only one office visit, ranging from 30 minutes to an hour. To start with, we may take “before” photographs or X-rays. Then, relatively small sections of the tooth enamel on the affected tooth are sanded off and the tooth is sculpted into a more pleasing shape, eliminating imperfections. 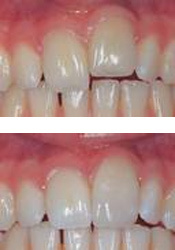 The sides of the teeth are shaped by using sanding strips in a back and forth motion. After the procedure is finished, your teeth are better matched in size and shape, giving a better overall appearance and making them seem less crowded. By removing only a small amount of tooth enamel, we can improve your smile and your self-esteem! If you presently have some minor imperfections in your teeth, such as chips, slight overlapping, ragged edges, pointy canine teeth, or minor wear to the biting surfaces, contouring may be the procedure for you! But first, we need to make sure your teeth are healthy enough for the procedure through a thorough examination of your dental X-rays. Contouring may have to be combined with other procedures (i.e., crowns, whitening, or veneers) to provide the best results. The doctor will determine whether you are a good candidate for this procedure. If you are, you will be amazed at what can be done to improve your smile in very little time, reasonably and comfortably! Give us a call to schedule an evaluation to determine whether you can benefit form our contouring procedure!